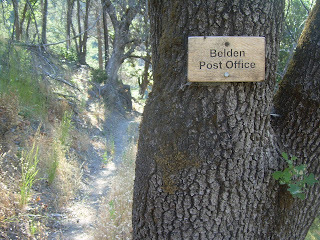 This sign marks the side trail off the PCT to the post office. July 22: I took my time getting up this morning. I had a maildrop in Belden to pick up, but the post office didn't open until 9:00, and I figured I was about a half mile away. By my calculations, I could leave as late as 8:50 and still get to the post office just as it opened. So I slept in late (until about 7:00), then killed time reading Time magazines. I was getting stir crazy, though, and finally left camp shortly after 8:00. I followed the trail about a quarter of a mile until the junction to the post office. 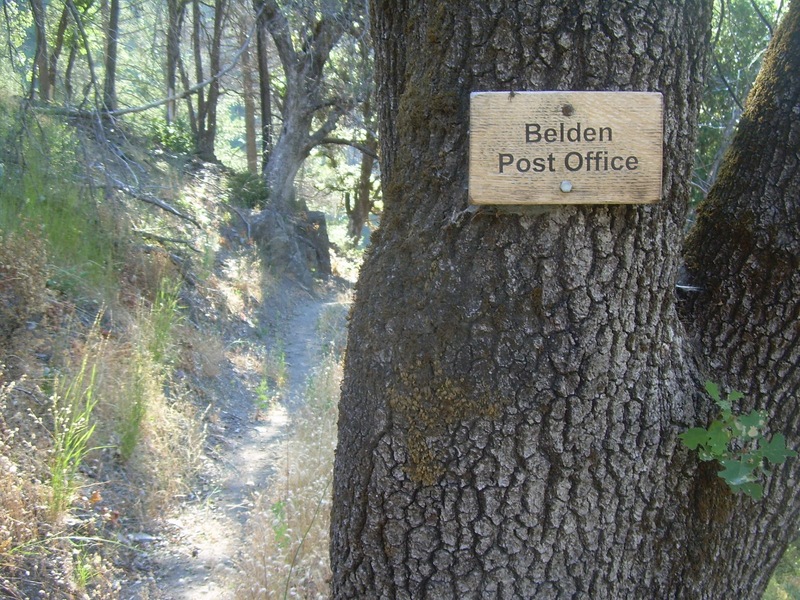 And it really is a junction to the post office--there was even a sign nailed to a tree that read, "Belden Post Office" at the trail junction, and I followed that down another quarter mile to the post office. As expected, the post office was closed, and would be for another 40 minutes. What to do...? What to do...? 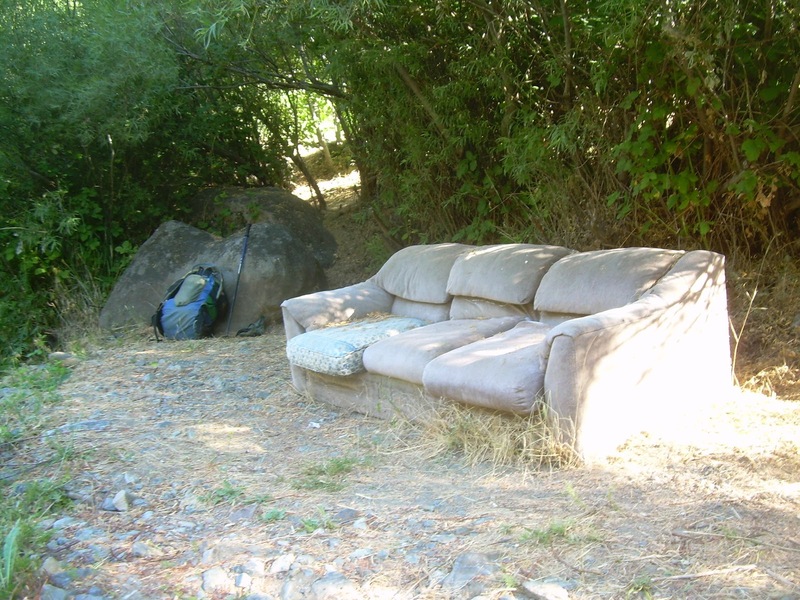 I walked down to the river running through town, thinking that would be a nice place to wait for the post office to open, and found a full-sized couch resting on the banks. Sweet! So I sat down, munched on some snacks, and read a bit more. At 9:00, I returned to the post office, and the door was already open. Excellent! And I walked into what is perhaps the most adorable little post office I've ever seen in my life! The inside looked more like an antique shop with all sorts of unusual items for sale and walls decorated with old postcards. I was so amazed, I even forgot to take any photos. Stupid! Stupid! Stupid! And the whole time, I kept thinking, "And where the heck is the so-called creepy, old town I kept hearing about? This place is so cute!" The woman behind the counter asked if I was here to pick up a package--clearly, I looked like a thru-hiker, and she knew why thru-hikers stopped at the post office. She pointed to a pile of packages at the other side of the store, telling me they were all over there. The haphazard piles of packages seemed to lend to the laid-back feeling of the town. The packages were ordered alphabetically by last name, roughly speaking, and I was the only C around. I sat down in a chair next to the packages and proceeded to open it and pack the contents into my pack. Most of the work was already done, back in the hotel in Quincy. I left the Wheat Thins in their original packaging since I hoped the box would help protect the fragile contents from the rough and tough transportation to Belden, but everything else was already in ZipLocks. Most of it went into my food bag. Some new reading material went into another bag. And a handful of snacks went into my snack bag. The Wheat Thins I transferred to a quart-sized ZipLock bag and stuffed in a pocket on the outside of my pack where they wouldn't get crushed (much). All the while, the lady behind the counter continued talking and asking questions about my hike. She was very nice, but I found her interest rather surprising. She's probably seen tons of thru-hikers, but she seemed just as interested in my tales as someone who bumped into a thru-hiker for the first time. I was happy to chat with her, though. steep climb when temperatures soared above 90 degrees. A few minutes later, my maildrop was packed and it was time to get hiking again. The woman behind the counter was surprised I was done so quickly when I asked if there was somewhere to trash the leftover packaging. She directed me behind the post office. The guy next door, she told me, would use it to help start his incenerator. 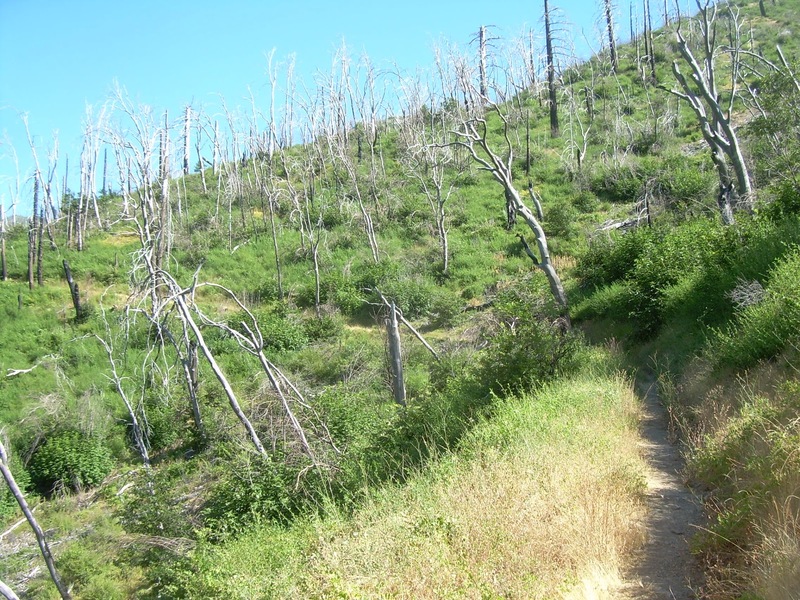 I followed the side trail to the post office back to the PCT, then almost immediately started going up--a hot, steep, 5,000-foot climb that never seemed to end. I started strong, and finished weak. 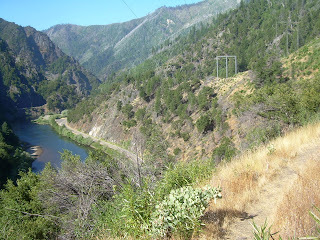 The climb was relentless, and the low elevation of Belden meant that the air temperature was hot. Even in the morning, it was hot. I think the forecast called for 90+ degree temperatures in Belden, and it already felt like that within ten minutes of leaving the post office. I filled up with water multiple times, even wetting down my handkerchief to help beat the heat, but I had to stop to rest several times along the way. I didn't want to stop and rest. I already got a very late start having to wait for the post office to open, and I still wanted to get in a respectable number of miles by the end of the day. any shade to beat the heat. A few hours into the hike, another hiker, Boat, caught up with me during one of my stops. We chatted a bit and learned that we had both thru-hiked the Appalachian Trail together in 2003. We were trail brothers! 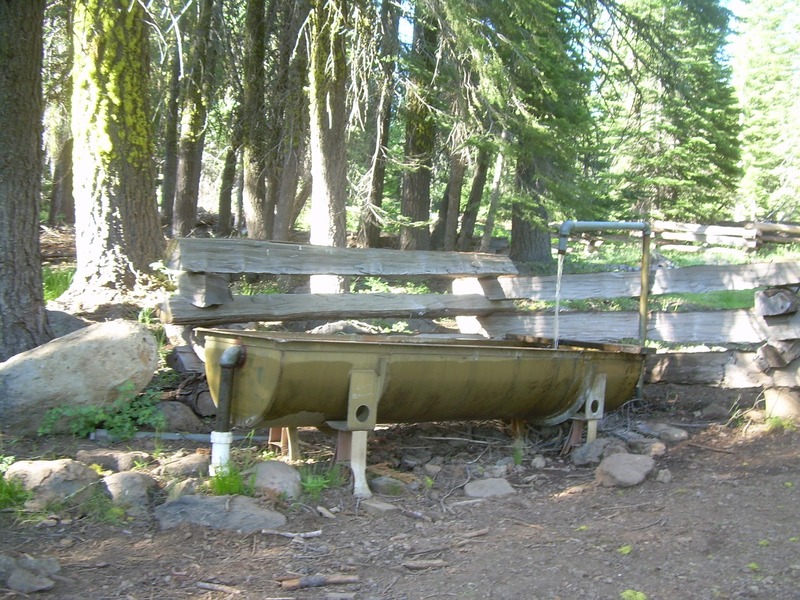 Despite hiking that 2,176-mile trail together, however, we never actually met each other. He started the trail about a month before I did, and he finished about a month before I did. I was never able to catch up, though undoubtedly, I'd read many of his trail register entries. He'd never have seem mine since I was always behind him, though. Onward and onward! Another hour went by and I caught up with two more hikers--Lone Ranger and Blackberry. I was rather surprised to catch up with them--while I did get a late start in the morning, I expected anyone who stayed at the trail angel's place would likely get a late start too, and still had a couple of miles to hike just to reach the point where I camped for the night. So I didn't expect anyone to be ahead of me, but those two managed to sneak by while I was down at the post office (or at least waiting for the post office to open). We talked about our adventures through the High Sierras, and it turns out that I left Kennedy Meadows within 24 hours of them, and best we could figure, we were within a day's hike of each other almost the entire distance since then--about five hundred miles--but never managed to cross paths until then. The trail is strange that way, hiding hikers--even those that seem impossibly close for such an extended period of time. 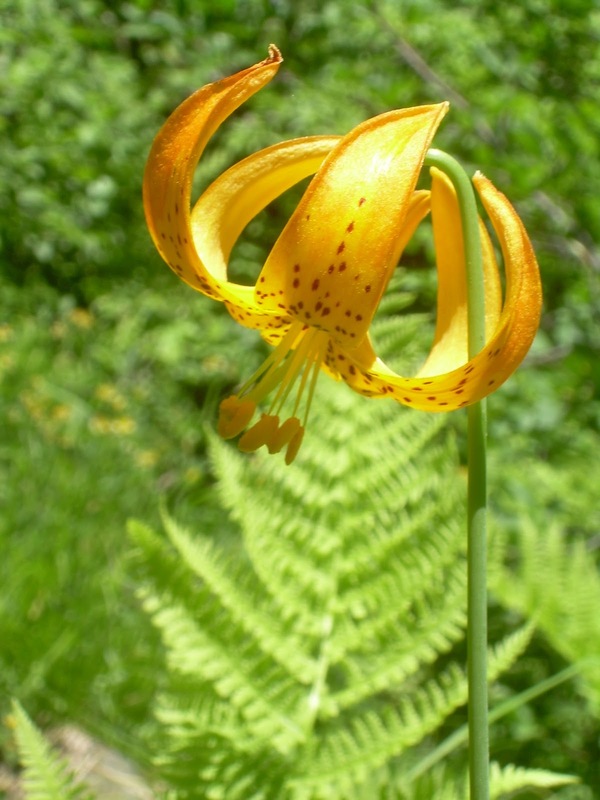 A tiger lily along the trail. Near the top of the 5,000 foot climb, the trail crossed several streams that required my feet getting wet. At least, I thought, my feet would be relatively clean at the end of the day. The last several days, the dry dirt on the trail would raise a small cloud of dust with every footstep and my feet looked positively caked with dirt at the end of the day. It couldn't be rubbed off--only a liberal dose of water could get the dirt off. As the trail climbed, the temperature dropped a bit. It was still uncomfortably warm, but it was a heck of an improvement being at 7,000 feet above sea level than the 2,350 feet where the post office was located. I once read that every 1,000 feet of elevation gain usually causes the temperature to drop four degrees. By my estimate, it should be nearly 20 degrees cooler up here. If the high in Belden was 95 degrees, the high up here would have been about 75 degrees. Very warm and uncomfortable, but tolerable. Those three stopped at Cold Springs for the night. I still wanted to get at least a full 20 miles of hiking in, however, and filled my pack with a horrible five liters of water and pushed on. Cold Springs was the last water source on the trail for more than 20 miles--at least the last known water source on the trail--so I needed enough water to last me through dinner, breakfast the next morning, and to get me through 20 miles of searing heat. And yes, I'm a wimp. So I loaded up with water. Once I used a lot of it for dinner and breakfast, it wouldn't be so bad the rest of tomorrow. And I didn't plan to hike too much further today. The trail crossed over a bald at the top of a ridge, and the scene was stunning. The grass seemed to glow in the fading light, and I decided to stop. Dry Pond should have been just ahead and I didn't know if the pond was really dry or not, but I didn't want to camp too close to it in fear that the bugs there could be bad. The bugs were already starting to come up, and in the trees, they were getting pretty thick. Out here on the bald, however, they didn't seem so bad. 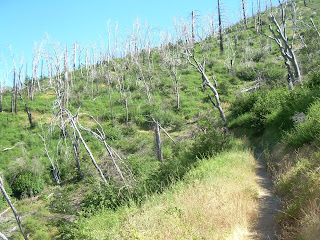 PCT for more than 20 miles. Use it or lose it! So I set up camp, made dinner, and relaxed. Lots of little bugs seemed to jump all around me, and I'm not sure what they were. They didn't bite, though, so I didn't spend much time worrying about them. The tiger lily photo is lovely. I've never seen them in the wilds, just on private property. Well that makes sense about the temp rising 4 degrees for every 1,000 ft.
We only live 20 minutes from Albuquerque, but most of the city is at 4,000' above sea level, while we're in the mountains above 7,000 ft. Even when it's 80-90 degrees in ABQ, we don't even have to use A/C or our swamp coolers. In fact we haven't used ours in years. But that also means that while it's 40-50 and sunny down in ABQ, we can be having snow storms.